This campaign has concluded, but if you would like to still make a gift to support Replant Mt. Oread, please click here. For this fall's “Trick or Trees” event, we will be planting 24 crabapple trees near the Campanile, along the sidewalks leading down the Hill. These trees will replace crabapples that have been lost to age over the years and will be a part of the Jayhawk graduation experience for years to come! This program relies not only on the volunteers who help with planting each year, but on the generous support of community members and alumni to fund the purchase of trees and planting materials, as well as rewards for our volunteers. In order to keep this new tradition alive, we need your support. Join us in keeping the University of Kansas campus one of the most beautiful in the nation by making a gift today! To sign up to volunteer for the October 27 Trick or Trees Replant, please visit https://sustain.ku.edu/replant/volunteer. On March 29, 1878, faculty and students gathered on Mount Oread to plant over 300 hackberry, evergreen, elm, and honey locust saplings as part of the first Arbor Day celebration at KU. In the decades that followed, more than 200 walnut and oak trees were added to what is now known as Marvin Grove, elm trees grew into a canopy over Jayhawk Boulevard, and flowering redbud and crabapple trees brightened the spring landscape, contributing to KU’s recognition as one of the most beautiful campuses in the nation. More than a century after that first coordinated plantings, the University of Kansas has established an annual tradition of bringing the campus community together to plant trees, ensuring that future Jayhawks can have the same experience as alumni who walked in the shade of oaks and elms of or enjoyed spring blooming trees while studying for finals. Since 2012, Replant Mount Oread has gathered campus departments, student organizations, community members, and alumni to plant over 100 trees throughout campus. Gifts of any size help us to maintain some of the most iconic trees and plants around the KU campus. Just as irises line Jayhawk Boulevard, with your support, the crabapples we re-plant will line the Hill for years to come. You don't even have to do the heavy lifting! Your gift will also reward students and other volunteers for their hard work. Cover the full cost of a crabapple tree that will brighten the Hill for students, faculty, and visitors for years to come! 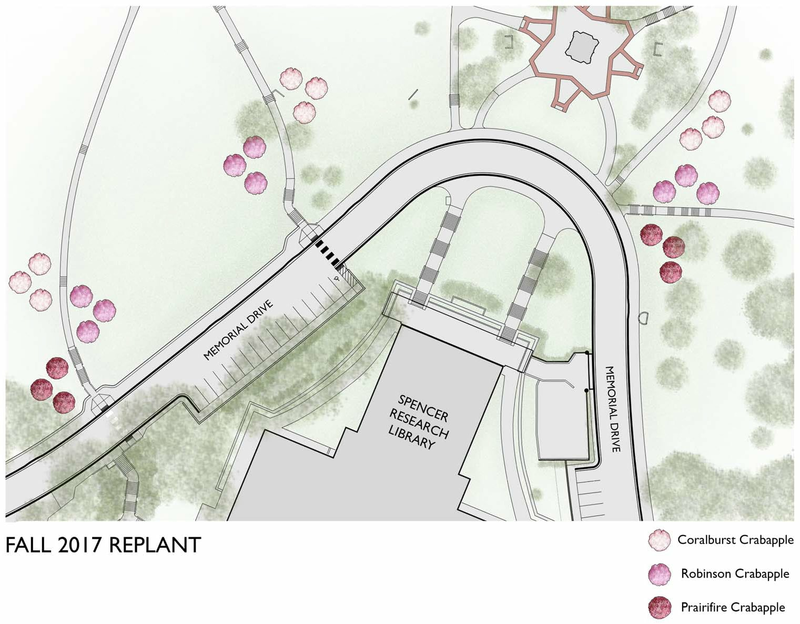 KU's campus wouldn't be the same without the oaks in Marvin Grove and our re-plant won't be possible without you.